"The idea was to rub pork belly with smoked paprika, salt, and cracked black pepper before slowly roasting until tender. 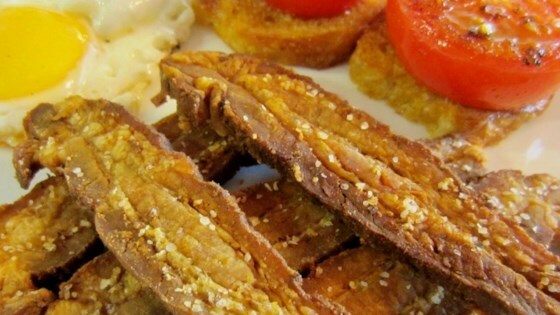 After an overnight chill, the belly would be sliced and fried crisp." Season pork belly with paprika, salt, and pepper. Tightly wrap pork twice in heavy-duty aluminum foil. Place on a baking sheet and bake in the preheated oven for 2 1/2 hours. Turn off the oven; let pork rest in the oven for 1 hour. Remove meat from oven, leaving it wrapped in aluminum foil, and refrigerate at least 8 hours or overnight. Remove pork from foil and slice across the grain in 1/4-inch thick slices. Working in batches, cook pork in a non-stick skillet over medium heat until golden and crisped, 6 to 8 minutes per slice. See how to make homemade bacon without curing or smoking. The flavors came together well and it really was simple to prepare. My husband and I both enjoyed it!